This is Kritterman’s first season to play basketball. Learning the fundamentals have been his focus. Passing, dribbling, standing his post, defensive and offensive moves. While the glory comes in making baskets, that was a skill that when in the heat of a game was more difficult for our little man. So fast forward to mid-season. Our local sports association had agreed to play with another local sports association to give both associations kiddos more games to play. Part of that agreement resulted in our association traveling to their home courts to play a tournament. What wasn’t shared with the coaches or our association’s Basketball Commissioner was that when they planned the match ups for the tournament… they put their kids aging the youngest on their teams a full year older than our oldest on our teams. So, for example, your 2nd grader age 8 would be playing a 4th grader age 9 1/2. It was daunting for all of the boys on the team. 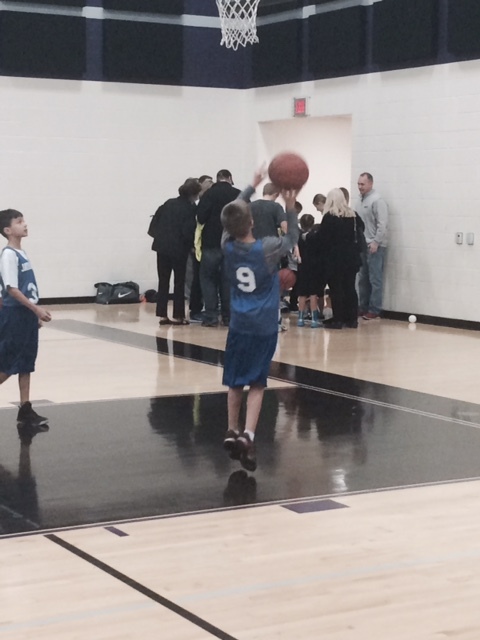 The shortest boys on the opposing team were still four to six inches taller. This huge difference in size was not lost on the boys. However, they rallied. Did I want to call attention to this obvious miss-match of age and by default skill? Of course, but in the moment, I had to make my kiddo believe that he could do the impossible. I would like to be able to say that the Jayhawks won both games they played in the tourney that day, but they didn’t. However, there were some amazing things that happened. The boys NEVER gave up. They played hard all the way to the end of both games. Even Kritterman had his moment… he shot for a basket and made his first one for the season in the second game. We were so excited we jumped up and screamed with joy. He had chipped his tooth right before the second game in a random accident… we were sure he wouldn’t bounce back, especially with the uneven pairing of the opposing team of giant 5th graders with his 3rd grade team. So it wasn’t a fair match. Did it frustrate the boys? Of course. Did I want to right the wrongs of the situation? Sure, what parent wouldn’t? But sometimes there is a time to talk and other times it is a time to stay silent. When have you stayed silent and let the life lessons rise to the top, that if you had spoke up, would have been thwarted?